Tectonic Pate » Why aren’t you an iPad? Why aren’t you an iPad? This week I have been mostly testing Android tablets. My thoughts: the on screen keyboards are all awful compared to Apple, the Market is a mess and no access to iPlayer on anything but the Galaxy Tab is just tedious. There are a couple of gems, though, which I’ll reveal later. 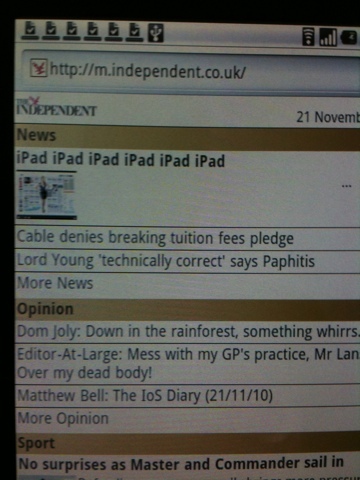 In the meantime, it’s amusing that browsing the Independent’s mobile site from a non-Apple device brings this up as the main headline? I guess not enough readers use it to have brought itto the devs’ attention yet.